I'm dedicating myself to my love of crochet and creating unique clothes for everyone from newborns to adult, and some special "furry babies" at this time. I hope that you enjoy them as much as I enjoy making them. If you don't find what you're looking for, please let me know and I'll be happy to do it up to your specific request. When I was just 9 years old, my grandmother taught me to crochet. I would sit for hours just to get it right. She truly passed on a wonderful gift to me, the gift of putting love in to everything I make. I hope to finally put my love for creating in to a full time job to support my family, so please feel free to contact me for special orders or just to let me know what you think! 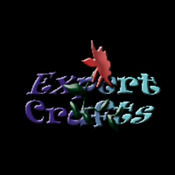 ExpertCraftss doesn't have any items in their booth!